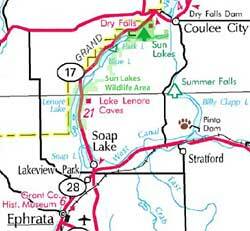 The Sun Lakes and Dry Falls area is an oasis of the coulee country and a sunny watersports mecca. It is also a big desert wildlife area in the midst of the Washington scablands, and one of the most important breeding grounds in the state for waterfowl. The area is part of the mile-wide Grand Coulee, a scar left from ancient floods, the old course of the Columbia River and now a rocky, shrub-steppe canyon bounded by spectacular thousand-foot basalt cliffs and talus slopes. A series of of alkaline lakes fill the coulee including Dry Falls Lake, Park Lake, Blue Lake, Alkali Lake and Lake Lenore. The Sun Lakes-Dry Falls area, which includes a state park, several resorts, campgrounds and a wildlife area, is easily accessible from parking areas along highway 17 and dirt side roads. It is located north of Soap Lake-- a town known for its arts, festivals and civic aspiration to acquire a giant lava lamp-- and Coulee City, host to the Last Stand Rodeo. Scenery, sun, fishing, and birds provide the greatest attractions at Sun Lakes - Dry Falls, and the area provides excellent hiking, mountain biking, photography, camping, stargazing, swimming and 'dipping-- and on Park Lake, water skiing. The fishing here is diverse, from roadside worm-n-bobber fishing, to trolling by boat to barbless flyfishing for bruiser Lahontan cutthroat trout. In springtime, these gargantuan trout can be seen swarming up a small spring creek located between Alkali Lake and Lake Lenore. Making an extra effort to be up and about here before sunrise can reward the aware with a shiver down the spine, and the realization that life is indeed very good. A central attraction for the area is Dry Falls, a geologic wonder of the world that offers amazing evidence of great floods that swept through the Grand Coulee at great depth and speed, thousands of years ago-- and over which spilled the old Columbia River. The cataract would have dwarfed Niagara Falls with a 3.5 miles wide and 400 feet high. For lovers of the little things, the Sun Lakes area is that it plays host to a colony of Yuma Skippers, a rare desert skipper in Washington and candidate for endangered status in the state. Yuma Skippers, named after an area in the Southwest U.S. Desert north of the Colorado River, were discovered at Sun Lakes State park in 1984. These large, late summer skippers are entirely dependent for survival on the area's native Phragmites reeds, which are adapted to these alkali lakes. Sun Lakes State Park is also known to be a good spot to see Mormon metalmark butterflies, which like many butterflies depend on a specific foodplant, in their case, snow buckwheat found in the area's undamaged shrub-steppe surroundings. These butterflies are at their peak around Labor Day. Besides sensitive butterflies, the park and wildlife area provide habitat for a variety of wildlife, the most visible being waterfowl and other birds that stop to rest and feed during annual migrations, or to breed and stay at the lakes for awhile. Ducks of all kinds live here, and pelicans, sandhill cranes, swans, and many other rare birds can be seen depending on the time of year. Red winged blackbirds sing cheerfully here and yellow-bellied marmots, badger, ground squirrels, muskrat, coyotes, jackrabbits, snakes and mice are also about-- and prairie falcons nest in the protective basalt cliffs. Care should be taken not to disturb the wildlife, however-- for example, in wildlife areas, state law prohibits letting dogs loose when wild species are raising their young during spring and summer months. Be sure to bring your Washington Department of Fish and Wildlife vehicle use permit to avoid risking a $66 parking ticket in the wildlife area - they can be purchased at fishhunt.dfw.wa.gov. Note that the road to Dry Falls Lake is closed at the state park during winter. For more information about the Sun Lakes and Dry Falls area, a variety of excellent sites are listed at the left of the page.